With Daniel Cormier out because of an injury, Jon Jones vs Ovince Saint Preux is the main event of the UFC 197. Don't miss our betting preview on Jones v St.Preux fight with betting tips, best odds, exclusive free bets and no deposit bonuses! Jon ”Bones” Jones (20-1) has dominated the light heavyweight scene, becoming the youngest UFC title holder ever early in 2011 at the age of 23. He has not stepped inside Octagon since a successful defence of the 205lb title back in January 2015, with drug controversies and a serious run-in with the law resulting in ‘Bones’ being stripped of the belt. Brandon Vera, Wladimir Matyushenko and Ryan Bader were all dispatched as well as Daniel Cormier in early 2015. His only career defeat came when he was disqualified for using illegal 12-6 elbows against Matt Hamill, so basically he is unbeaten in the UFC. 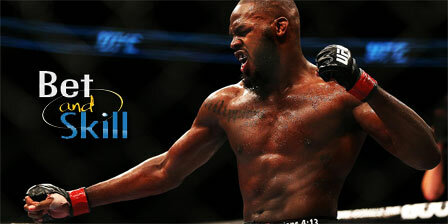 Jon Jones is the best pound-for-pound fighter in the world. He can grind with his vaunted wrestling skills, or use his long limbs for long range strikes. He has the second-longest reach in the entire UFC roster at 84.5 inches. The only questions are about ring rust and exactly what type of fighting shape he’s in. Ovince Saint Preux boasts a 19-7 record in his career with a 7-2 record in the UFC. Nine of his wins - four of them in the UFC - have come by knockout. He had a great start to his UFC career, winning his first four in the Octagon with three finishes. Anyway, Saint Preux has lost two of his last five fights against men Jones has beaten with relative ease – Glover Teixeira and Ryan Bader. St. Preux , an athletic specimen and former Tennessee Volunteer football player, stands at 6-foot-3 with an 80-inch reach. He’s very tough to take down and even harder to keep down due to his cat-like reflexes and brute strength. He is a dangerous fighter, but his biggest strength (punching power) is countered by Jones’ excellent chin. "Jon Jones v Ovince St.Preux predictions, betting tips, odds and free bets (UFC 197 - 23 April 2016)"